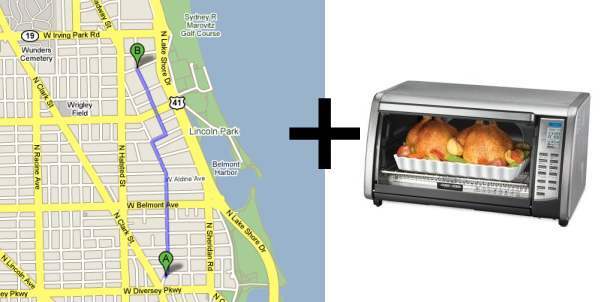 Saturday wouldn't have been complete without me doing something somewhat out of the ordinary.. like.. carrying a toaster oven almost a mile and a half through Chicago. A toaster oven isn't that heavy, and 1.3 miles isn't that far, but the shape and size of the box is big enough to be awkward. And awkward enough to become almost unbearable pretty quickly. 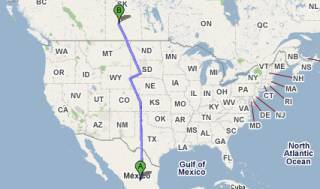 From this, you can easily see that I practically walked across a good chunk of North America. Pictures don't lie. Did you toast yourself a good chick'n while doing the walk? I'm happy to see your zig zagged your journey to stop in Wyoming. Though it must have been confusing to go from South Dakota to Nebraska to Wyoming to Nebraska to Colorado to Nebraska to Kansas. I hope the Nebraska border patrol was friendly.